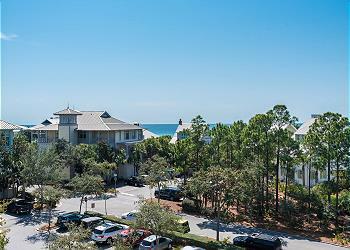 DETAILS: Located conveniently along 30A this wonderful 3rd floor beachside residence has accommodations for four. Escape into paradise as you step out onto one of the two featured balconies on the 3rd and 4th floor that offer magnificent views of the Gulf of Mexico. Entering on the first level you will find a spacious open floor plan including a bathroom, kitchen, dining room, and living room. The kitchen bursts with light from the surrounding windows and is equipped with stainless steel appliances. Just off the kitchen is a wooden dining room table set for four with additional seating for two at the breakfast bar. A full bath features a shower and single vanity located just off the entry way. The beautifully furnished living room offers ample seating, a queen sleeper sofa, and Flat Screen TV with DVD player. 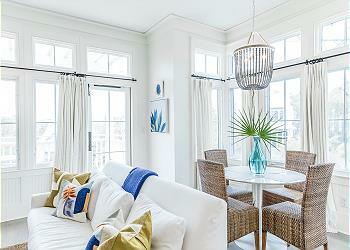 From the living room step out onto the furnished balcony and take in the fresh Gulf air. The master suite is privately located on the second level. The master suite includes a king size bed, a Flat Screen TV, and a furnished balcony offering great views. The master bathroom has an oversized shower and a single vanity. This home is perfect for a romantic getaway, is in the center of multiple dining and shopping options, and an easy stroll to the Bike Barn or the BeachClub. We were with the 4 of us and had an awesome experience. What a beautiful place and everything is at hand! It’s also a big plus that the location is in Watercolor center and a short bike ride from Seaside. It is a wonderful property where you can see the ocean from the top balcony. We enjoyed our time for 3 nights. There were two moms and two daughters. The only thing we noticed is the blinds are very worn. There are many windows so you have to close them at night. Other than that everything was perfect. We are so glad that you enjoyed your stay at this amazing condo in Watercolor! We agree that this condo is perfect for a short stay and we especially love the photo you shared! Thank you for staying with 360 Blue, we hope to see you again very soon!